A good part of the funds available under the tribal sub-plan for 2012-13 may be diverted to non-tribal areas with the government proposing to spend funds on the tribal population living outside. The country has a geothermal energy potential of around 10,000 MW, but not a single geothermal plant. The project team of a joint Indo-Norwegian venture today proposed that Tatta Pani in Mandi, Manikaran and Vashisht in the Kullu valley and Puga and Chuma-Thang in Ladakh can be developed as geothermal tourist destinations if these natural sources of energy are tapped properly. With the Assembly elections in sight, the panchayat secretaries working on contract have threatened to go on mass strike, demanding the regularisation of their services. A 24-year-old doctor died, while her two colleagues sustained serious injuries after the car they were travelling in rammed into a tree on the Sangrur-Raikot highway today. The Himachal Pradesh Employees Confederation has expressed resentment over the alleged failure of the BJP government to frame a policy regarding service conditions of panchayat technical assistants and the alleged discrimination against the category in the matter of salary and other financial benefits. The State Electricity Board Employees Union has decided to start an agitation in view of the cancellation of a meeting convened by the management of the board for holding negotiations on February 27. Taxi operators in the state have decided to observe a strike on March 1 in protest against the manifold increase in various taxes on transport vehicles in the state. HPCC president Kaul Singh has demanded a CBI inquiry into allegations against Health Minister Rajiv Bindal regarding acquisition of assets disproportionate to his known sources of income levelled by the Himachal Lokhit Party. After a long spell of inclement weather in the upper Kullu valley, bright sun and clear sky greeted tourists and local residents today. With winter’s good spell of snowfall in the Solang valley, 13 km from here, hundreds of domestic and foreign visitors have thronged Manali. Himachal Pradesh state Congress vice-president and former Lok Sabha MP Chander Kumar has stated that the leadership of Union Minister Virbhadra Singh can not be ignored as he had a massive mass base and rank and file support across the state. The BJP has refuted the allegations of Union Minister Virbhadra Singh that private educational institutions opened in the state lacked academic standards and asserted that he was making such motivated charges to divert the attention of the people from the internal tussle in the Congress. Even as the state government is endeavouring to generate revenue to meet its ever-increasing liabilities, the Excise and Taxation Department, which contributes about 65 per cent of the revenue, is yet to decide whether to renew the licences of existing vends or invite fresh applications. The CPM has taken exception to the action of the Chief Minister of holding a review meeting of the Himachal Pradesh Private Educational Institutions Regulatory Commission and said it clearly indicated that it was a proxy body of the government. A one-day “pre-conference” under the Continuous Medical Education (CME) programme here today underlined the benefits of research studies to the common patient and the role of continuous medical education in postgraduate training programmes. Ayurvedic Block Medical Officer (BMO) Rajmal Saklani, accompanied by other members in his inspecting team, was surprised when his sudden visit yesterday to Ayurvedic Health Centre, Sandiyar, near Barthin, 45 km from here, revealed that the entire staff, led by its in charge doctor, were absent. There was no one to open the centre till 10.30 am, though the opening time of every health centre is 9.30 am. Himachal Pradesh University has allowed two additional chances for improving the score to those who have obtained the Shastri degree in May 2011 and thereafter and could not get 50 per cent marks. Two persons were killed and one injured in two separate road accidents in the district. The two killed have been identified as Jagmohan Sharma of Rewalsar and Nikka Ram of Sanarli, Karsog. Kuldeep Singh (35), son of Milkhi Ram of Barot under Fatehpur police station, tried to commit self-immolation by setting himself on fire today. According to the norms, 9 per cent of the funds under the annual plan are allocated for the tribal sub-plan. Accordingly, the figure for the next financial year, for which the annul plan of Rs 3,700 has been proposed, comes to around Rs 330 crore. So far, almost the entire amount was being spent for undertaking development activities in the notified tribal areas of Kinnaur, Lahaul-Spiti, Pangi and Bharmour. Occasionally, some funds were allotted for projects like hostels for tribal students and tribal bhawans outside the tribal area. The proposal for diversion of the funds has been based on the plea that 60 per cent of the tribal population has moved out from the scheduled tribal areas and settled in other parts of the state. Further, according to the guidelines of the Centre, the funds have to be utilised for the benefit of tribal population. However, under the criteria framed by the state in 1993 for the purpose, 40 per cent weight has been given to population, 40 per cent to economic backwardness and 20 per cent to the area. The criteria has not been adhered to all these years and funds were mostly being spent on the scheduled tribal areas. In fact, in recent years, the government has given funds to the state power corporation and the state transmission utility from the sub-plan, which are spent only in Kinnuar district where power projects are under implementation and thus leads to distortion. Under the latest proposal based on the state criteria, 60 per cent of the funds available under the population criterion of 40 per cent (Rs 132 crore) will be spent on tribals living outside the scheduled tribal areas. As such about Rs 80 crore could be diverted for spending on Gaddis and Gujjars living in parts of Kangra, non-tribal areas of Chamba, Solan and Sirmaur districts. However, the move is likely to be opposed by the people living in tribal areas, particularly the three MLAs representing the tribal constituencies. Further, the government will have to carry out surveys to identify the areas where tribal population is concentrated and come out with projects which actually benefit them. It remains to be seen if the government takes the risk of diverting the funds at a time when the Assembly elections are just months away. On a “save-hot water springs mission” in the western Himalayas, the team of scientists today inspected the Tatta Pani hot water springs in the district and proposed to the government its action plan. The team says this natural source of geothermal energy is facing depletion if it is not saved and relocated at Tatta Pani town. The hot water springs will be submerged in the 800 MW Kol Dam project, being executed by the National Thermal Power Corporation (NTPC) on the Sutlej. Though the NTPC claims that it has relocated the hot water springs at a higher elevation at Tatta Pani town, the team found that it needs a proper geological study and a fresh initiative to relocate the geothermal energy. Dr Arya, a geologist who has entered the Guinness Book of World Records by boring the highest tube well in the world in Ladakh, said they had inspected the Manikaran and Vashisht hot water springs in Kullu-Manali, Puga and Chuma-Thang in Ladakh. “Iceland has tapped geothermal energy and is known worldwide as a geothermal tourist destination,” he added. “The country has a geothermal energy potential in excess of 10,000 MW, but not even a single geothermal plant has been set up so far,” Dr Arya said. He said they could tap this energy from lava as had been done in Iceland and the Philippines. They say they have been working as ad hoc employees for the past eight years. “Our work is the same as that of the regular panchayat secretaries, but we get meagre salaries. According to the government policy, the services of contract employees are regularised after eight years. However, this norm is not being followed in our case,” a panchayat secretary alleged. The panchayat secretaries also have the support of village pradhans. In Dharamsala block, 28 pradhans have come out in support of the panchayat secretaries working on contract. The pradhans say in case the panchayat secretaries go on strike, they will not be able to use the funds allotted under MNREGA. The panchayat secretaries working on contract have already held a strike in Kangra district. They have been holding dharnas at the block level in support of their demands. They have threatened to go on an indefinite strike in case their demands are not met by the government by February 28. Sources said the strike by the panchayat secretaries had hit the utilisation of MNREGA funds in villages. In many villages, MNREGA workers had not been paid salaries. The development work in rural areas depends on the panchayat secretaries who are responsible for executing the decisions taken by the panchayats. However, the government may face a difficulty in regularising the services of the panchayat secretaries working on contract as it can be taken as a “back-door entry”. Courts in many cases have ruled against such regularisation of employees. The courts have held that the proper procedure should be followed while selecting employees for government services. The victim has been identified as Dr Ashima of Kullu, Himachal Pradesh, was a practising doctor at Christian Medical College (CMC) and Hospital. The incident took place in the wee hours here today, when Dr Ashima, along with her colleagues Dr Ashish (25) and Dr Amrinderpal Singh (25), was returning to the city after attending a function at Sandour village in Sangrur. Investigating Officer (IO) Jasvir Singh said Dr Amrinderpal Singh, who was driving the ill-fated Skoda Superb, rammed the vehicle into a tree to save an animal that had suddenly came in front of it. The injured were rushed to the CMC by area residents. Ashima was declared brought dead, while the condition of Ashish was stated to be serious. He had sustained multiple fractures. Amrinderpal’s condition was stated to be stable. IO Jasvir Singh said inquest proceeding had been initiated under Section 174, CrPC. In the meantime, heartrending scenes were witnessed at the CMC Hospital. Ashima’s parents were inconsolable. Principal, CMC & H, SM Bhatti said Ashima was a promising doctor and her death was a tragic loss to the fraternity. Addressing a joint press conference here today, president of the confederation Vinod Kumar and president of the Panchayat Technical Assistants Association Kulbhushan Sharma warned of an agitation if the government failed to come out with a policy regarding bringing them under the contract system and regularisation of their services in the Budget. They were playing an important role in the development of the basic infrastructure in rural areas, but had been handed out a raw deal by the successive governments. The previous Congress regime had discontinued the honorarium fixed earlier and introduced the commission system for making payments to them for the services rendered by them. As a result they ceased to be government servants. They could have been brought under the contract system if the policy of honorarium had not been discontinued. They asserted that they were discharging duties on a par with draftsman and they were not being paid remuneration commensurate with their work. The process of appointing panchayat technical assistants was started in 2000 and at present there were over 1,000 of them on the job. The BJP had promised to regularise their services in its election manifesto, but more than four years had passed and no action had been taken in this direction. It alleged that the management was deliberately depriving the employees of their rights and avoiding discussion on their demands and maintained that the meeting had been cancelled with such malicious intentions, leaving no option for the union but to start an agitation. In the first phase, it would hold gate meetings on February 28 during lunch hour in front of various offices of the board throughout the state. Besides wanting a regular meeting between the management and representatives of the union, the main demands of the union include the withdrawal of the decision of the government to sell BBMB power to the board on the average power purchase cost instead of the existing “bus bar rates”, which will put an additional burden on the consumers. The call for the strike has been given by the All-Himachal Taxi Operators Union Mahasangh, after holding a state-level meeting recently, which has been endorsed by different taxi operators’ unions. The taxi operators have urged Chief Minister PK Dhumal to intervene and get the notification regarding the increase in transport vehicles’ tax withdrawn. The taxi operators have warned the government to immediately withdraw the increase in the taxes failing which they will start an indefinite strike from March 5. Kaul Singh, who was on a visit to the Indora area of Kangra district today, while talking to The Tribune said since the allegations against the sitting BJP ministers had been levelled by former BJP leaders, only a CBI inquiry could bring out the truth. He said the former BJP leaders had given property details and corruption charges against sitting ministers also, along with facts. Since the allegations had been made against top leaders of the BJP, including ministers who were privy to the working of the present government, the Congress demanded a CBI inquiry into the matter. Kaul Singh said the BJP was on the verge of disintegration in Himachal due to corruption by a few ministers. So strong was factionalism in the party that even a sitting Kangra MP’s son had joined the splinter group. It is not just the Congress, but a major faction of BJP leaders who were levelling charges of corruption against their own government. Since the allegations were being levelled by former senior leaders of the BJP, they assumed more significance. Kaul Singh said if the present government did not order an inquiry, the Congress would do so if voted to power after the next Assembly elections in the state. He also alleged that the present government had failed to protect the interests of horticulturists of the Indora area. The Indora area horticulturists, who were famous for their mango and kinnow orchards, had been complaining of consistent losses. Many farmers were now uprooting their orchards. Kaul Singh once again reiterated his allegation that Kangra was being discriminated by the present BJP government. He alleged that most of the projects that had come to the district had been financed by the current UPA government. He alleged that the present BJP government had failed to utilise the funds being provided by UPA government for the development of the state. Kaul Singh was accompanied by prominent Congress leaders, including GS Bali, Ajay Mahajan, Brij Behari Bhutail and Ajit Mahajan. However, the leaders of the Virbhadra faction were conspicuous by their absence. This is the third visit to Kaul Singh to politically significant Kangra district in the past 10 days. The Solang valley, lying to the north of Manali town, has attained worldwide fame owing to its spectacular ski slopes and a clear view of the Pir-Panjal ranges. 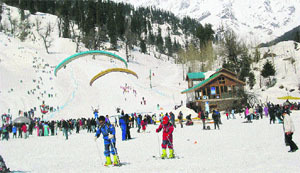 The ski slopes in the Solang valley also has the distinction of hosting a number of national ski competitions. This year the entire upper Manali region experienced a good spell of snowfall and people in the tourism industry predict that it will bring about a long summer season in Kullu-Manali. The Manali-Rohtang Pass road is closed to vehicular traffic due to a thick wall of snow. On account of this, the famous Solang Valley has nowadays become a magnet for domestic and foreign visitors. 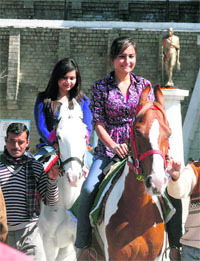 A festive atmosphere again prevailed in the Solang Valley as tourists were seen enjoying skiing, paragliding, sledging, riding on snow mobiles, horses and yaks and having photo sessions. With a good spell of snowfall in the region, a number of temporary kiosks have come up in the entire upper Manali areas, offering woollen garments and snow shoes for the unprepared tourists. This has become a source of livelihood for hundreds of local residents. Talking to mediapersons here today, he claimed that Virbhadra Singh was the real face in the party who remained Chief Minister of the state five times. “If the Assembly elections are contested under the leadership of Virbhadra Singh, who is our party’s start campaigner, the Congress is sure to come back to power in the coming Assembly elections provided all senior leaders of the party extend their services for this purpose. It is high time to unite all Congressmen in the state to highlight anti-people policies of the Dhumal government,” he asserted. He said the issue of who would be the next Chief Minister if the Congress was voted to power should be left on the party high command, the first priority was to give a united fight to the BJP. Lashing out at the ruling Prem Kumar Dhumal government, Chander Kumar said it had failed on all fronts and the BJP had vertically divided after sidelining senior party leader Shanta Kumar who was now keeping himself away from state party affairs. General secretary of the party Ram Swaroop Sharma and party spokesperson Ganesh Dutt said Virbhadra Singh was silent about the scams and scandals plaguing the UPA regime. Spokesperson Ganesh Dutt claimed that permission was granted for opening private universities after ascertaining the quality of infrastructure and other required facilities. The state had changed its excise policy four years ago with a view to breaking the monopoly of contractors who had been grabbing the lion’s share in the liquor business. Now the same scenario has emerged again as the department has not opted for fresh allotment since then. The present policy restricts the opening of new vends as it offers only limited scope with the existing licencees posing objections on the plea of their sales get divided. This has deterred the department from opening new vends. The policy is also leading to considerable revenue loss, especially along border areas where the department can not effect a substantial hike in the reserve price confided field officials. Though the reserve price is hiked annually, it fails to be competitive vis-a-vis neighbouring states. Since several housing projects, industries, hydel power projects, universities and several infrastructure projects are coming up across the state, the growth of liquor sales at these places is as high as 50 to 200 per cent, while the department is only effecting a marginal hike. With neighbouring states like Haryana and Punjab inviting tenders for allotting vends on a fresh basis for the past several years, it clearly shows that the exercise generates more revenue. The state’s Excise and Taxation Department on the contrary is only renewing the existing licencees’ licences which are allotted in 2007 rather than inviting fresh applications. The department has pegged its revenue at Rs 700 crore for the current financial year on account of liquor sales. Commissioner Excise and Taxation Department Jagdish Sharma said they had registered about 22 to 23 per cent revenue hike through liquor sales and the modalities of the new excise policy were being worked out. Member of the state secretariat of the party Tikender Panwar said it was shocking that the commission, instead of effectively regulating the private universities, was allowing these to play with the money and career of students. Glaring irregularities had come to light in the private universities, but the commission had not penalised any institution so far or imposed a fine. That it was a rubber stamp of the government became obvious when a meeting of the commission, which had its own chairperson, was chaired by the Chief Minister. “It seems the cat is out of the bag now and the hope that the commission will fulfil its mandate to ensure academic standards by penalising erring institutions has been belied,” he said. He added that there had been instances where private universities had admitted Class X pass students to five-year integrated courses of engineering and management in stark violation of the law. He said students had to pass Class XII before undertaking a course for acquiring the engineering or management degree. The party has asked the government and the managements of private universities to return the money to students who had been defrauded and pay compensation to them. Despite this no lessons had been learnt and large-scale admissions to the PhD course had been carried out by private universities, which hardly had any faculty to act as guides. In case of the failure of educational institutions to follow the norms, the commission would have the power to penalise the educational institutions. In case of successive failure, the commission could recommend to the state government or the regulatory body for winding up the institution”. Stating this here today, Dr Sunil Raina, joint organising secretary, 39th IAPSM Annual Conference, said this pre-conference at the DRPGMC Tanda was part of the national-level medical conference scheduled to start here tomorrow. He said it was for the first time in the history of the Indian Association of Preventive and Social Medicine (IAPSM) that two CMEs were attended by 150 doctors from India and Nepal at two different venues on the DRPGMC Tanda campus. He said one CME was held at the Shoba Singh auditorium which was conducted by Prof Sanjay Zodpey of the Public Health Foundation of India and the topic was “Case Control Studies-Design Conduct and Analysis”. He said the other CME was conducted at Sansar Chand guest house where Dr Shankar Prinja from the School of Public Health, PGI, Chandigarh, delivered goods on “Cost Effectiveness Analysis in Health Care”. He said both the CMEs were productive and attended by postgraduate students and junior faculty members from the Department of Community Medicines from all over the country. Both the CMEs were inaugurated by Dr Anil Chauhan, Principal, DRPGMC, Tanda, and Chairman, 39th IAPSM Annual Conference. Reports said patients who were waiting outside the centre said this was “routine” and the staff took its own time to reach and start the day’s work which kept patients waiting, some times for hours. The inspecting team summoned panchayat representatives and took their signatures to note their absence. The BMO assured the representatives that he would report the matter to the higher authorities. They can appear in the examinations to be conducted in April and September, 2012, the Controller of Examinations said in a press note. The fee for these chances will be Rs 1,000 and the last date for the submission of the examination form is March 15. The examination will be held according to the new syllabus being followed at present. 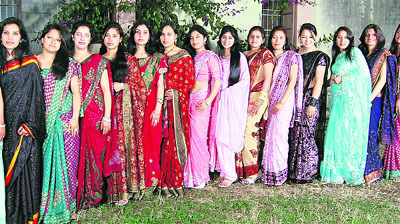 The university will conduct the annual examinations of BSc Nursing (second year), batch 2009-2014, from March 15 in respect of the Shivwalik Institute of Nursing, Shimla, Lord Mahavira BSc Nursing College Dattowal, Nalagarh, Murari Lal Memorial College of Nursing, Solan, and Netaji Subhas Nursing College, Palampur. The last date for the submission of the examination form is March 3. Injured Jai Ram of Lathari, Karsog, is under treatment at the IGMC, Shimla. According to the police, Jagmohan’s van (HP24 A 0119) had a head-on collision near Naulakha on National Highway No-22 with another vehicle (HP31 5130). But he succumbed to his injuries at the IGMC, Shimla. In the second case, Nikka Ram, who was driving a Maruti car (HP02M-0179) lost control over his vehicle, which plunged into a 70-80-ft-deep gorge under Karsog police station. Nikka succumbed to his injuries at the Civil Hospital, Karsog. The police has registered cases and started investigation. He had come at his in-laws’ house at Minjgrah village, near here, to attend a marriage. Following an altercation, he took the drastic step to attempt suicide. Sustaining 75 per cent burn injuries, he was rushed to the local Civil Hospital where he is stated to be in a serious condition. He was married five years ago in the village. According to DSP Rajinder Jaswal, a case under Section 309, IPC (bid to commit suicide) has been registered against him.